Inkin' It Up With Kendra! : Owl You Doin? Hello my crafty friends and Happy Wednesday! I've been so busy with work and also in my craft room over the last week...I've gotten several cards done, but here is one that I am really loving! I decided to go with a more simple design, which is really hard for me, I love to have a lot going on! 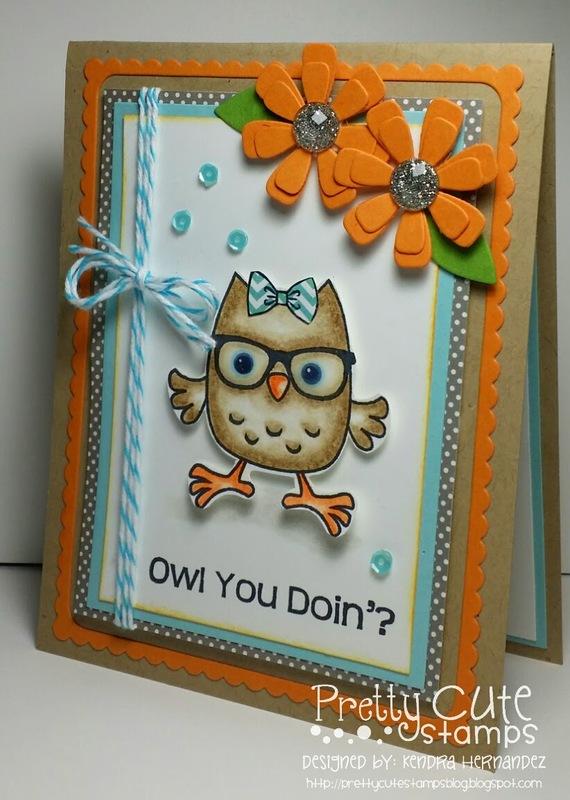 :) I used "Chick with Brains" - one of the new August Releases from Pretty Cute Stamps - love this image! The little bow is a separate stamp (which you can use for a bowtie or a hairbow! ), I stamped it on some patterned paper, cut it out and then glued it on....love it! I'm really happy with the way it turned out and I'm really lovin' this color combo (saw it on a pinterest board). The center frames (my new diecuts from Simon Says Stamps - link below in my supplies) are popped up on dimensionals for a little extra depth. Thanks for looking and I hope this gives you a little bit of inspiration....if you haven't grabbed this set yet, run over and get it! Don't forget to stop by the Pretty Cute Stamps FB page, like us and also post your PCS designs - we'd love to see what you've come up with! Have a fabulous day - I'll be back soon with more crafty goodness! Kendra!!! I love your card!! It's so cute. 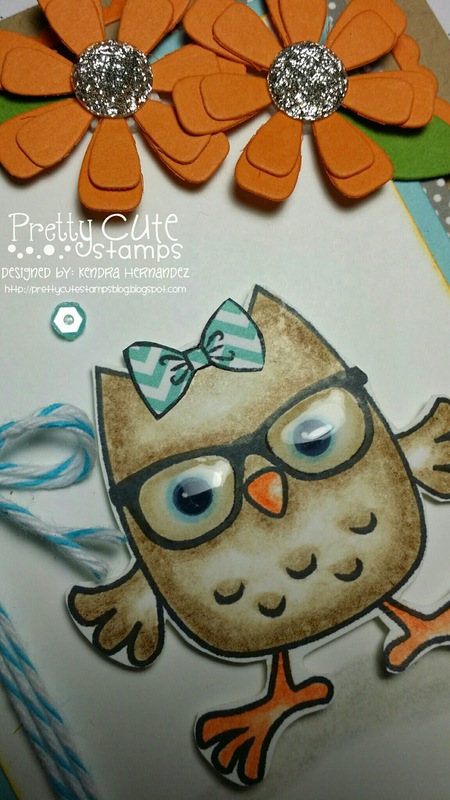 You make me want to get that owl stamp! I should have got all of them! I love working with Gamsol too! It makes blending so easy!! You did a grat job here!! I see those frames!! Thank you my friend!!! You definitely need this set...it's so versatile and we'll just so darn cute! Yes I love the Simon Says Stamp frames! 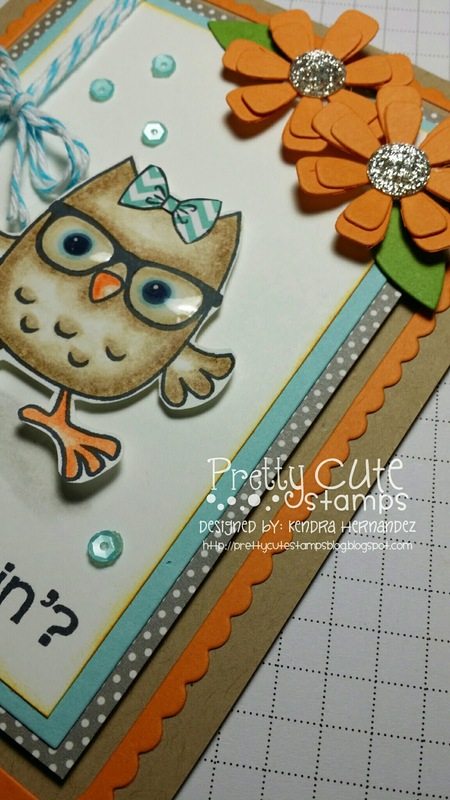 August Release Blog Hop - Pretty Cute Stamps! Pretty Cute Stamps August Release Sneak Peek!